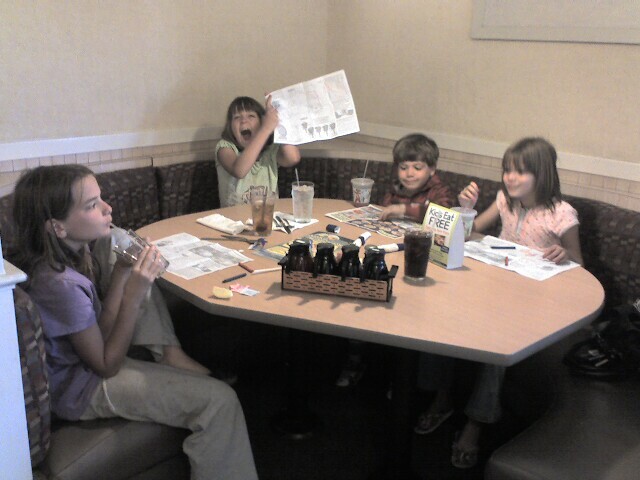 We're halfway home, at an IHOP in the middle of nowhere. We cut the camping short by two nights because (in husband-who-disagreed-with-my-other-reasons-convincing part) our innocent-faced little Captain there was running like he was fueled with pure rocket fuel. It was like chasing a lit firework. Or a squirrel that had been pounding back Monster sodas. I am SERIOUSLY exhausted right now. That boy ran me a merry chase these last five days. Wait'll I tell y'all what-all he managed to get into on this trip. Whooooooo-wee. Wee! And they look so sweet and innocent! Hey, no point in getting back from your vacation so exhausted it takes a month to recover. A couple of extra days at home sounds like a good plan. Just remind yourself you weren't planning to get anything done these next two days - and try not to! Can you go lock yourself in your car with your knitting and music playing softly in the background for 2 days? No? I guess that wouldn't work with the kids. Hope you can rest before going back to work - or maybe going back to work WILL be your rest. Here's hoping you'll be able to look back some day and smile with the pleasant memories of this family vacation. wow. that's all I can say as I imagine Captain Adventure lose in a campground.